Liverpool winger Sadio Mane has continued his excellent run of form by opening the scoring for the Reds against Fulham, the star played a lovely one-two before scoring. 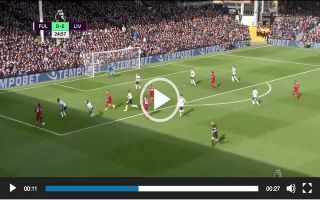 Mane’s opener came in the 25th minute of the tie, the Senegalese star started with the ball out wide before drifting into the box and playing a pass to forward Roberto Firmino. Mane made a smart run after laying the ball off to Firmino and the Brazilian picked him out the middle of the box and the former Southampton star easily put the ball into the back of the net. This is Mane’s 17th league goal this season, it’s worth noting that the exciting winger has scored all of his goals from open play. With Mane now scoring 5 goals in his last 3 games, could the star be making a late run for the Premier League’s Golden Boot?